Prime Minister Nguyen Xuan Phuc, his spouse and the high-ranking delegation of Vietnam made a trip to Singapore for the 33rd ASEAN Summit and related summits from November 13-15 at the invitation of his Singaporean counterpart Lee Hsien Loong. During the trip, PM Phuc attended and addressed 18 meetings and sessions as well as had meetings and working sessions with leaders of many countries. On the occasion, PM Phuc cut the ribbon to open the Vietnamese goods week in Singapore. Prime Minister Nguyen Xuan Phuc arrived in Port Moresby, Papua New Guinea for the 26th APEC Economic Leaders’ Week at the invitation of his Papua New Guinea counterpart Peter O’Neill. 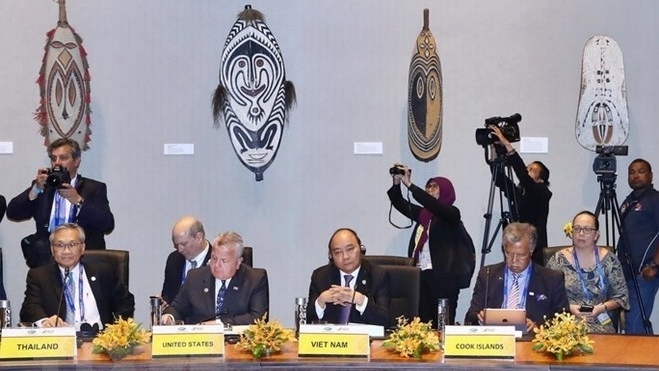 He attended a dialogue between APEC leaders and the APEC Business Advisory Council (ABAC) as well as a dialogue between APEC leaders and leaders from 14 Pacific island states, among other activities. Party General Secretary and President Nguyen Phu Trong joined local people in celebrating the great national unity festival in Nguyen Du ward, Hai Ba Trung District, Hanoi on November 14. Chairwoman of National Assembly Nguyen Thi Kim Ngan also attended a festival in Nam O Village, in Thuy Trinh commune, Thai Thuy district, Thai Binh province. In addition, many other Party and State leaders joined the great national unity festivals nationwide. The 2018 Vietnam Craft Village Trade Fair is taking place in Hanoi from November 17-21. The event features more than 150 pavilions from centres and craft villages around the country, displaying unique and refined handicraft products, agro-forestry and fishery products, food and beverages, souvenirs, and specialties. The well-known novel by Bao Ninh titled ‘Noi Buon Chien Tranh’ (The Sorrow of War) won the only prize at the Asia Literature Award 2018. The novel tells the story of a soldier who grows reflective as he collects dead bodies after a battle. Cong Phuong and his teammates celebrate after the first goal for Vietnam. 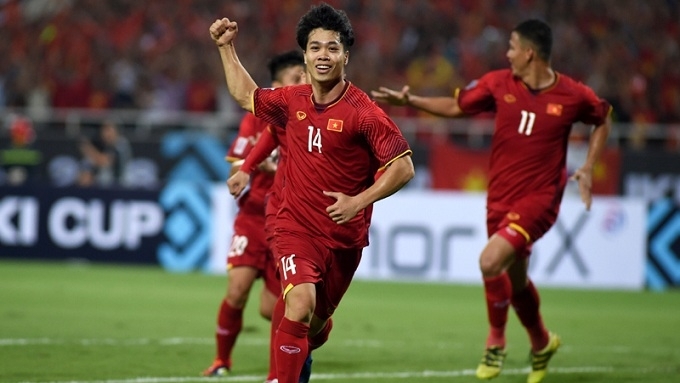 Vietnam cruised past Malaysia, with two straight goals in the match in Hanoi, to join Myanmar on top of the 2018 AFF Suzuki Cup Group A with six points after two matches. The goals were scored by Cong Phuong and Anh Duc.